Projects > LiF March 2017 > Why do you want to mess up rivers and slow down the water? This is a question often asked by landholders when they’re thinking about becoming part of the Rivers of Carbon program. Rivers of Carbon focuses on boosting biodiversity, sequestering carbon, and empowering communities to act with confidence in response to climate change. The program works with landholders and Landcare groups across the southern tablelands of New South Wales, and have projects in the Goulburn, Breadalbane, Upper Murrumbidgee and Yass regions. So, why do we want to mess rivers up and slow them down? To answer this question, a broad range of perspectives is needed. The community was invited to hear what experts had to say. A workshop was organised, with a Traditional Owner, wildlife ecologist, river geomorphologist, social scientist, and landowner present to address this question. 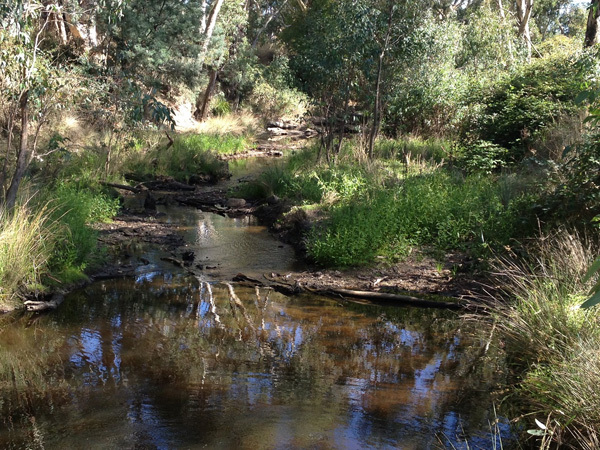 What became immediately apparent is that ‘messy’ is better for wildlife, river health, carbon sequestration, biodiversity and recreation, yet often the policies and beliefs about what ‘good land management practices are’ has led to cleared paddocks, less wood and ‘litter’, straightened streams, and water flowing as quickly as possible. A ‘messy and complex’ river, restored by planting a mix of grasses, shrubs and trees and letting nature do the rest. Photo: Haydn Burgess. The presenters explained how these activities reduce the complex habitat native wildlife needs to thrive, decreases water quality and bank stability, and impacts the ability to spend time along our rivers fishing and connecting with nature. “Natural river systems are complex, ‘messy’ and retain water, nutrients and carbon. Modified river systems are simple, ‘neat’ and designed to keep water moving. These systems are carbon poor. It is estimated that modified river systems store less than 2 percent of the carbon they used to,” Ellen explained at the Australian Stream Management Conference in 2016. Rivers need to be messy and have ‘room to move’, so that they can perform a range of functions, providing habitat and food for a wide range of animals, as well as having a range of flows and movement. Disturbance and movement is really important for rivers, creeks and streams, as the beds of rivers need to ‘turn over’ so that the water is oxygenated, and pools and riffles are formed. Some fish only spawn in submerged trees and logs, so we need these structures in our rivers for this to happen. What the workshop also showed was how much landholders, working with programs like Rivers of Carbon, can do on their place to boost biodiversity and improve productivity. Margie Fitzpatrick, a local Goulburn landowner, gave an inspiring talk about the range of methods she has used to ‘mess’ things up and slow the water moving across her paddocks. “Some have been ‘hard engineering’ like flumes and rock chutes, but these have been mixed up with ‘soft engineering’ using vegetation, logs, rocks and haybales, to fill eroding channels, enabling moisture to be retained and plants to grow,” Margie said. Margie concluded her talk by sharing her ‘why’ – her reasons for doing what she does, which underpins the reason for the Rivers of Carbon initiative. The ‘Mess it up and slow it down’ workshop is now on-line for anyone to access on the Rivers of Carbon website titled ‘a Great Gig in Goulburn”. For more information on Rivers of Carbon visit www.riversofcarbon.org.au or email enquiries@arrc.com.au or call 02 6247 7997. Rivers of Carbon is a partnership between the Australian River Restoration Centre and Greening Australia, supported by Federal and State Governments and local Landcare Groups.